Testing waters? 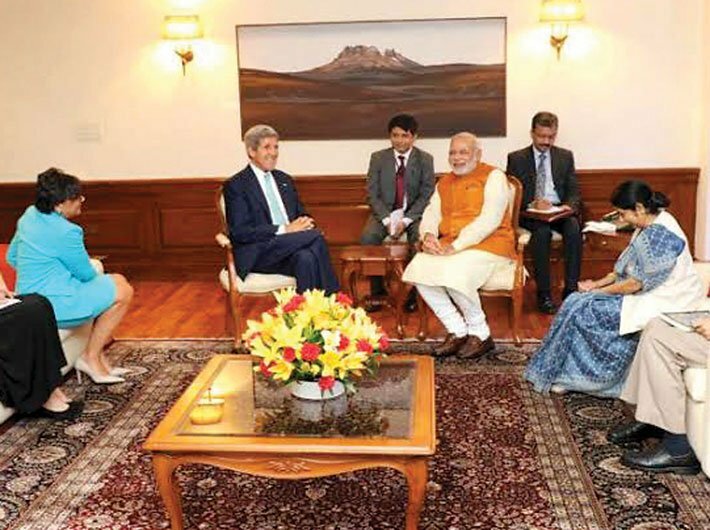 US secretary of state John Kerry during his meeting with prime minister Narendra Modi. If artifice is intrinsic to diplomacy, the agenda of the meeting between US secretary of state John Kerry and prime minister Narendra Modi on August 1 was apparently much less about the trade facilitation agreement (TFA) than it was made out to be. The long list of queries Kerry posed for Modi gave away the real intention of the US, which is desperately trying to size up Modi’s personality and his thinking. A long stretch of visa denial to Modi has deprived the US of critical inputs on him. US diplomats were convinced that Modi would never be at the helm of affairs in India. Much of this assessment was based on inputs from the India-based staff of US missions in Mumbai and Delhi. With Modi taking charge in New Delhi, the US state department is as baffled as the US embassy staff in India by Modi’s mystique. Ahead of the crucial meeting between US president Barack Obama and the Indian prime minister, Kerry’s stint in India was to gauge the ‘foe’, so to speak, which was palpably significant for its diplomatic posturing. Kenneth Waltz, one of the most prominent scholars in international relations, in his seminal work Man, State and War, explicates three levels of analyses for the causes of war. The first level is the ‘first-image’ analysis wherein the nature of a political statesman or a state leader, given their proclivity for aggressive stances, is taken to be a cause of war. In essence, the Modi-Kerry meeting was a dry run of the Waltzian first-image analysis to understand the former’s mind in case of diplomatic misalignments, of which there have been several instances in the recent history of India-US relationship. The come-back-all-is-forgiven stance was taken even before Modi became prime minister, with the then US ambassador to India, Nancy Powell, paying a visit to him in Gandhinagar. Beginning with the now well-known July 28 speech, Kerry binged on the Modi moment. It was the first acknowledgment at the highest levels in the American administration of the acceptance and enthusiasm in fostering stronger ties with the political firmament of the Bharatiya Janata Party (BJP), given the troubled history between the Indian leader and the US government, which might have proved to be an Achilles heels in the relationship. It is important to note that the India-US strategic dialogue, which takes place every year, is held alternately in the two countries. This year it was USA’s turn to host the event. However, Kerry chose to come to India despite the fact that his plate is rather full in terms of crucial diplomatic engagements – the disastrous Israel-Palestinian conflict, the tenuous Iraq situation, and the uncertainty in Afghanistan. This was the US testing the waters; the meeting with Modi would have happened irrespective of the World Trade Organisation (WTO) bearing. Kerry would have got a first-hand account of the ‘inscrutable’ Indian prime minister as well as of his most important ministers and top officials during the delegation-level talks with external affairs minister Sushma Swaraj. His feedback would be particularly important for the Obama administration. Modi will visit the US in September to attend the 69th session of the United Nations General Assembly (UNGA). Subsequently, he will visit Washington for a bilateral meeting with Obama. This is a departure from the usual convention, as US presidents do not hold bilateral meetings while UNGA is in session. Obama could do without unpleasant surprises in his debut meeting with Modi. It is important to note that all matters of interest to India – be it the nuclear liability bill, the snooping on BJP members by the US, or Pakistan – were discussed only during the restricted talks and the delegation-level talks with Swaraj. Kerry did not raise these issues with Modi. But what Kerry was interested in was the prime minister’s views vis-à-vis the near and far neighbourhoods of India, especially China. China has replaced the US as India’s biggest trading partner. With the downturn in the US economy, there will be an urgent need to look for commercial opportunities, including markets overseas. With its huge middle class population, India ought to be a strong presence on the US commercial radar. The stated objective is to push up trade figures to $100 billion. Kerry linked US investment with a pliant Indian response to trade barriers. He said, “We have a lot of work yet to do in breaking down barriers to trade and in encouraging the talent that we both have to be able to go to work.” However, the flurry of diplomatic activities and the strong emphasis on neighbourhood trade and commerce after the new regime was installed must have come as a surprise to the western powers. The neighbourhood, which had been neglected by India thus far, is assuming importance in the foreign policy approach. Apart from leaders of neighbouring countries attending Modi’s swearing-in ceremony, his first overseas trip was to Bhutan. His plans of visiting Nepal were also public before Kerry’s visit. Also, the prime minister has accepted Nawaz Sharif’s invitation to visit Pakistan and talks between the foreign secretaries have resumed after 2012. Moreover, Modi has already had talks with Chinese president Xi Jinping on the sidelines of the BRICS summit at Fortaleza and is scheduled to meet his Japanese counterpart, Shinzo Abe, in the first week of September. A more compact Indian subcontinent, with India’s better relations with China and Japan, will signal a major change in political dynamics of Asia. The US has to adapt, and adapt fast. Similarly, the Fortaleza declaration establishing the BRICS New Development Bank happened with much alacrity. Though the BRICS bank, in a real sense, is no threat to the World Bank, deeper China-India-Russia ties cannot augur too well for the US. Kerry with this visit has gone back with an initial sense of whether the new prime minister will walk the talk of a stronger neighbourhood and also of India’s probable relationship with US allies and foes over the short-term future. The cues will come in handy for Obama in September as well as for meeting his stated position of a rebalance to Asia. Similarly, the TFA issue was more important as a tool to gauge the extent to which the new dispensation would encourage business and foreign investment given Modi’s image as a business-at-all-costs leader. Kerry was disappointed both with the disagreement over the TFA issue as well as clinching a deal with India on climate change before the 21st session of the conference of the parties to the United Nations framework convention on climate change, scheduled for December 2015 in Paris. Modi is discerning enough to understand that foreign policy cannot override concerns of the domestic constituency. He reportedly told Kerry that though India respects the Bali agreement and that he does not want to throw a spanner in the works, America must understand that India has special concerns given its large number of people living below the poverty line and the government’s responsibility of providing food to that section at an affordable cost. Kerry’s disappointment was more so over the fact that business in India has to factor in the social cost, notwithstanding Modi’s renewed emphasis on economic diplomacy. The exercise was akin to reading a book of the What to expect…genre. The especially popular What to expect when you are expecting book is designed for educating first-time mothers – to help them deal with their conception and forging a relationship with an entity they have not seen before. The Kerry reading is expected to give Obama a fair idea of what to expect when he meets Modi. TFA was only a red herring.